« Cooperative Extension is largely restored – thanks to YOU! The other Saturday I rambled down to Bee Heaven to pick up a tilapia and some callaloo for dinner. If you’ve never done that, you’re missing out on some good eating. The fish are ridiculously fresh. They were swimming early that same morning just before getting put on ice. You won’t eat anything fresher unless you catch it yourself. When you order a tilapia, you get the whole fish. It’s your job to scale, gut and clean it before cooking, but that isn’t too difficult to do. 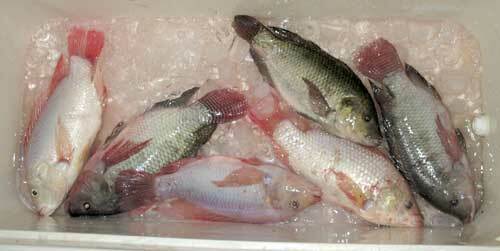 The average weight per fish is about 1.5 pounds, maybe a bit more. The tilapia is farm raised by Wayne and Carmen of American Viking Aqua Farms, a mom-n-pop operation right around the corner from Bee Heaven. Although the fish is a bit more expensive than what you can get at at the grocery store, it has been raised without chemicals. Technically they are not organic because the fish food isn’t, though Wayne and Carmen want to move in that direction. They also use a biofilter to clean their water, and have a natural filtration system which lets them use the nutrients to grow native mangroves for use in bioremediation projects. Plans for Mr. Fish were to roast it whole. It was scaled, gutted and cleaned, then its cavity stuffed with slices of lime and branches of fresh thyme, and more lime slices on top. Was baked it in the oven at 350 for about 20 minutes (more or less), until the flesh flaked when stuck with a knife. Mmmmmm good eating! The flesh was tender, moist and delicate. Limes on top kept it moist, and the flavors of lime and thyme permeated. Well, maybe a bit too much lime… will try with lemon next time, and use a bit less, and add garlic or onion. I don’t pretend to be a chef, or even a halfway good cook, but I have my moments and this was one of them. Your meal is only as good as the ingredients! 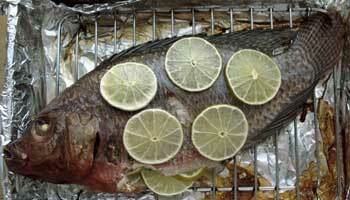 If you got a tilapia how did you prepare it? Feel free to share your recipe in the comments section below!